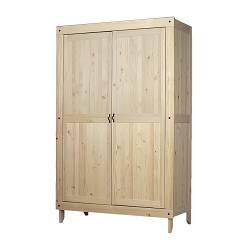 If you're looking for some new bedroom furniture on a small budget, then IKEA is a great place to check out, as most college students, first time movers etc... can agree on. 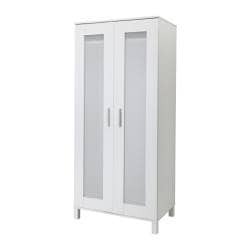 IKEA carries a large selection of closets, wardrobes and armoires in various styles and designs - and they are all low priced and quite affordable. That is one thing which is pretty great about IKEA: even if you don't get the best quality in the world, you still get style and good looks. The design aspect hasn't been skimped on, you can in fact find really neat, cool and sleek looking furniture, and all without breaking your budget. 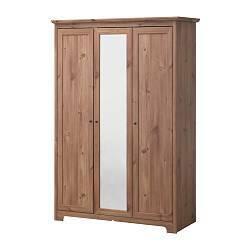 These IKEA closets, wardrobes and armoires are available in classic wood as well as different shades. 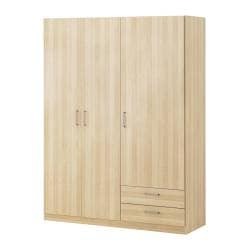 You can also find different sized wardrobes and different storage solutions which you might not have thought of. There are actually quite a few smart storage solutions etc... within their pieces. When you walk through an IKEA store (which sometimes can feel a bit like a maze) then you often get struck by the ingenuity with some of the furniture: they are well thought through and they are definitely a little different from most other furniture store's pieces. The price however is something that certainly sets IKEA apart from other furniture stores. These furniture are very reasonably priced, yet they hold a high design standard and can be personalized and made to fit your space perfectly. That is really one point to think more about: many of these pieces can be sectioned off and you can buy pieces to build an almost custom made look furnishing for your home. So no matter whether you're looking for a large, three-door wardrobe, or a smaller two-door closet, you're sure to find something over at IKEA. Just remember, quite a few of these closets do need to be attached to the wall in order to be completely safe. This is easily done, as long as you actually do it, because you don't want to accidentally forget and then maybe have it tip over you. This probably won't happen, but when you pay a lower price, you definitely want to take considerations like that seriously. Other than that, it's definitely worth looking at their furniture and finding pieces which would work in your particular decor. Adjustable, self-closing hinges included.Main parts/ Door frame: Particleboard, Foil, Polypropylene. A mirror door saves space and makes the room feel larger.Knobs included. 4 adjustable shelves and 1 clothes rail included. 5 shelves and 1 clothes rail included. Min. ceiling height required: 78". May be completed with ODDA wardrobe for added width. The bottom drawers have casters and are easy to move. Full-length mirror on the back of the door. Knobs on the wardrobe sides allow you to hang clothes on the outside as well; the knobs come in two lengths. Untreated solid wood can be treated with lacquer, wax, stain or oil for a more durable surface. 1 stationary shelf and 4 adjustable shelves included. Handles included. 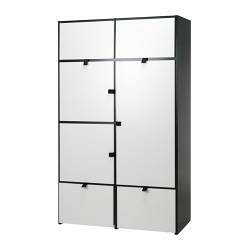 Name: lisa | Comment: Does IKEA still carry the ODDA wardrobe? They didn't have it when I checked out their store. Please advice.